Fig and Olive for Dine LA was a treat. The menu looked interesting and the French/Mediterranean restaurant focusing on figs and olive (oil) was intriguing. The interior was nicely appointed and full of sunlight. This made for a perfect situation camera lighting wise. Only if all of my pictures were to enjoy all this sunlight. The food was plenty and delicious, and the whole experience from start to finish was so relaxing. From olive oil in every dish and figs nicely accenting everything, lunch was a pleasure. 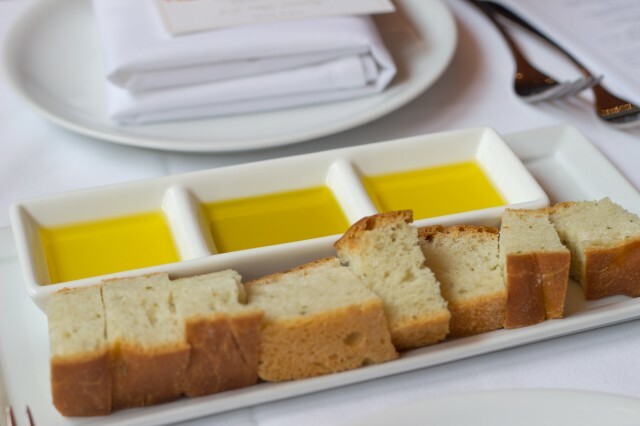 To start things off, we had the bread and olive oil trio. Dipping the focaccia into the three different types of olive oil, it was really a taste test of how different each oil can taste. Each of the three high quality olive oils had such a distinguished taste profile. It was some of the best olive oils I ever had — It made me appreciate the olive oil as an ingredient and how it can be used so simply. 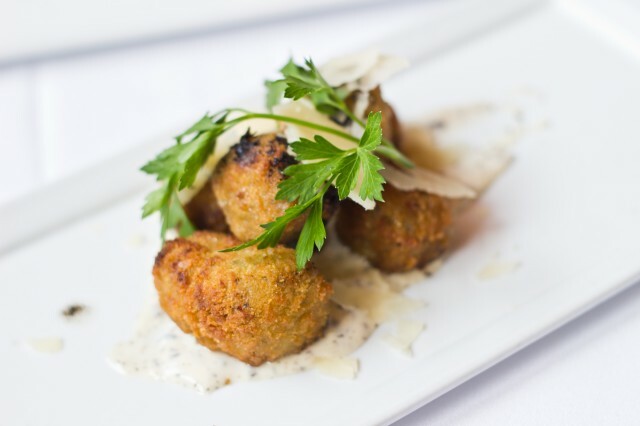 For the appetizer, I chose the truffle mushroom croquettes. These little morsels filled with a cremini mushroom, parmesan, and béchamel was so rich and tasty. Fried to a perfection, the outer layer was crisp and the inside was gooey. The mushroom flavor really came through, and then was accented with the truffle olive oil aioli. The deep earthy notes of the truffle and mushrooms really gave a flavor profile like nothing else. It was battered fats and carbs, fried, then dipped in more fats, but it was so delicately prepared. It was a nice start. 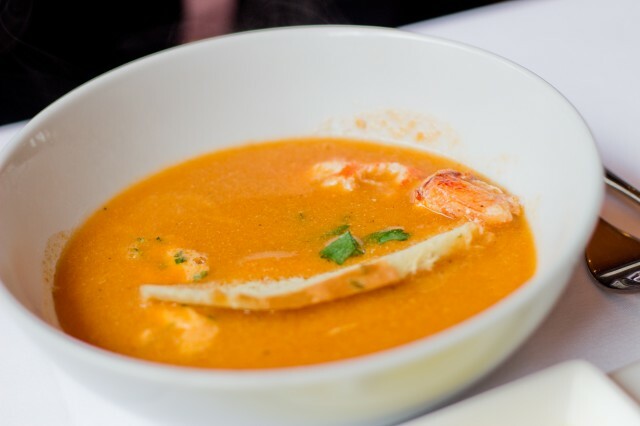 The lobster bisque to me was a miss. It didn’t have that wow factor or taste profile I thought it would have. The chive crackers and pimento (Spanish paprika) mascarpone were a nice touch, but if the broth is not good, everything falls apart. Even the additional cost for the lobster meat didn’t save this dish. The soup was just too watery and not thick enough. It tasted more of sea salt than the sea itself. I don’t know what happened here, but the mushroom croquettes was easily the better of the two. To save us from the disaster of the lobster bisque, we indulged ourselves in some of the crostinis. Fig and Olive being known for their crostini, we had to order some. 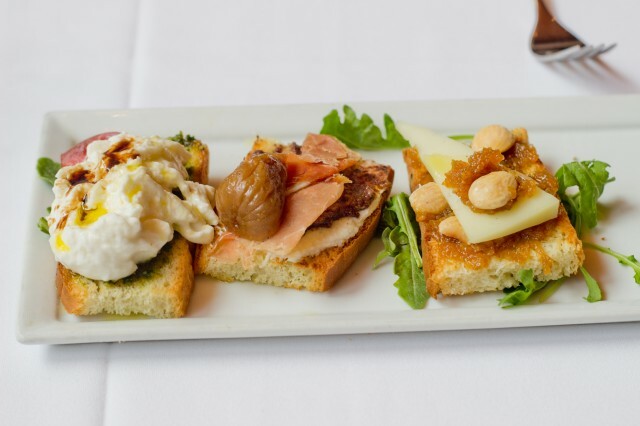 We went and chose three: burrata, tomato, herb, balsamic, and olive oil, / Manchego, marcona almond, and fig jam, / prosciutto, ricotta, fig, olive, and walnut. Of the three, my absolute favorite was the burrata; it was so silky smooth and kind of took over your mouth. With the classic mixture of tomatoes and balsamic, the flavor was so pure and delicious. The Manchego with almond and fig jam was good, but the overly sweet jam didn’t balance out too well. The prosciutto and fig crostini was nice — I do love my prosciutto, but the fig was again, too sweet for my liking. Maybe more prosciutto would have better countered the sweet fig? Maybe a lot lot more. 🙂 Definitely, the burrata was the best of the three. I had some of the penne mushroom tartufo and it was quite nice. The big bowl of pasta was definitely a lot to handle. 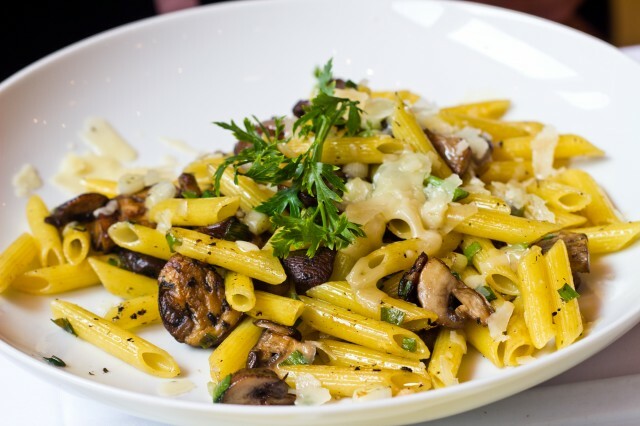 A mix of cremini and black trumpet mushrooms and penne was all that was needed to make this an awesome pasta dish. Mixed in with some parmesan, parsley, scallion, and white truffle olive oil, it was perfect. The mushrooms had a nice bite to them, and yes — no meat. The mushrooms in this dish did wonders. With the help of the white truffle oil, the flavors really transpired nicely. The herbaceous notes of the parsley and scallion helped liven up the dish as well. It was a lot of a good thing. A lot of times, I like to order at least one thing I either don’t usually order, or I usually don’t make at home. I ordered the lamb skewers. Though it wasn’t as satisfying as the penne, it was still a delicious entree. 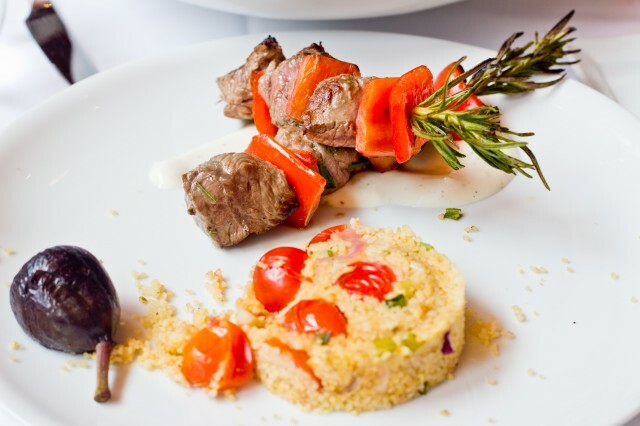 The grilled lamb on rosemary skewers was brilliant — each bite was soft, perfectly medium rare in the middle, and infused with rosemary — The bell peppers also gave some flavor as well. The Greek yogurt and honey sauce was great with the meat, as was the roasted whole fig on the side. My favorite item on this dish was the couscous. Combined with onion, tomato, and scallions, the couscous was fluffy and aromatic. It went well with the delicious lamb. For dessert, the chocolate pot de creme was a nice choice. Filled with a rich and creamy chocolate pudding, it was perfect for a chocolate craving. The cool part (no pun intended) was, the top layer was a vanilla ice cream, and the bottom was the chocolate. My favorite was the crunchy praline financiers. 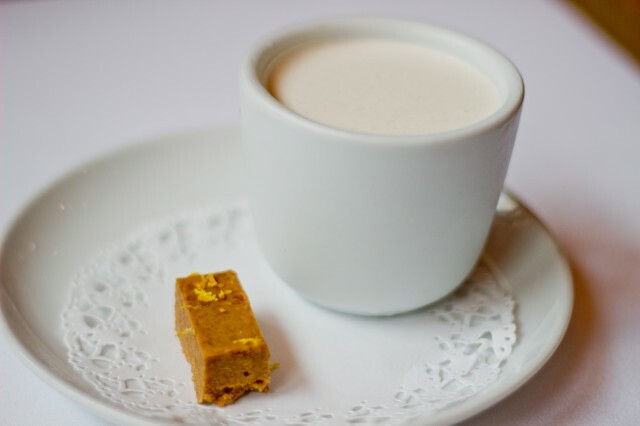 It was sweet, buttery, and light like a wafer — It was nothing like I ever had. The French waffle was more familiar to me. Though the waffle looked crispy, it was lacking in that department. I was expecting something along the lines of a liege waffle, but I guess the French waffle is more fluffy and light. It was still tasty with the berries and cream. 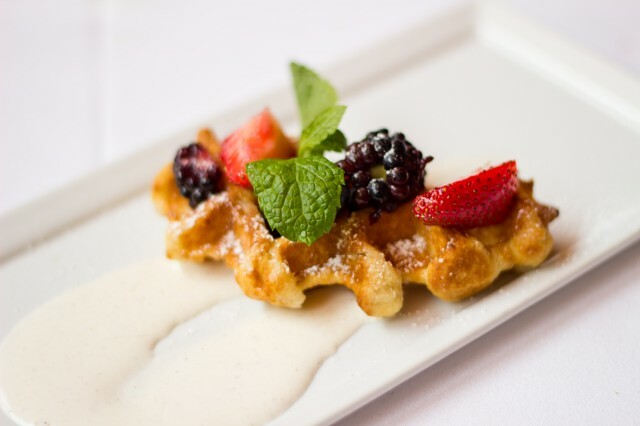 It was a classic combination with the waffle. The French, Mediterranean restaurant celebrating the fig and olive (oil) in their dishes really came through. The decor inside made me want to live there. With the bright lights shining through, to the heavenly whites and bushes of rosemary throughout, the interior was soothing. The food was masterfully prepared. The play on sweet and savory, as well as figs and olive oil in almost every dish was evident. 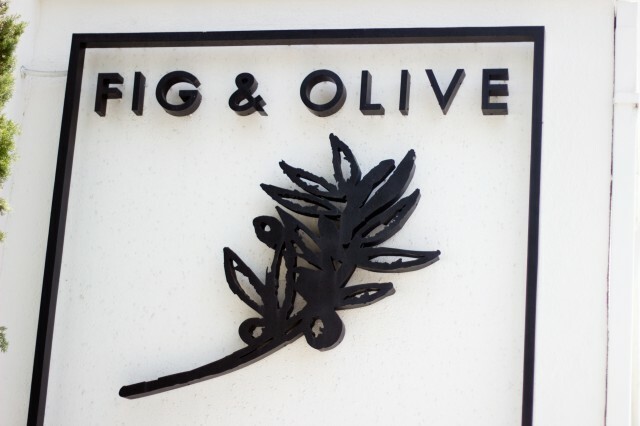 I had a relaxing time here at Fig and Olive, and thanks to Dine LA, it was an experience for sure. 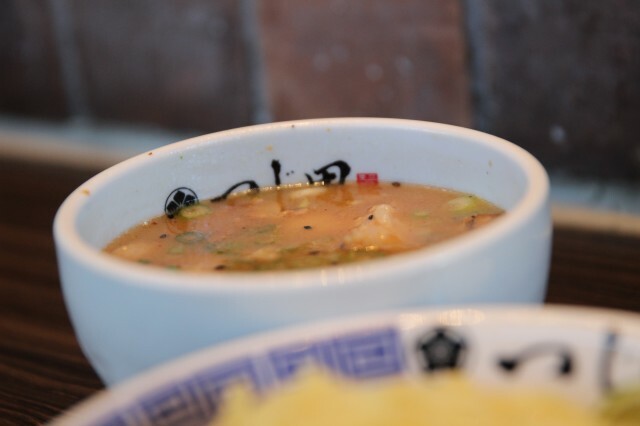 We are bangin’ out the new year with ramen. Noodles are a representation of long life, and is a perfect way to start off the new year. 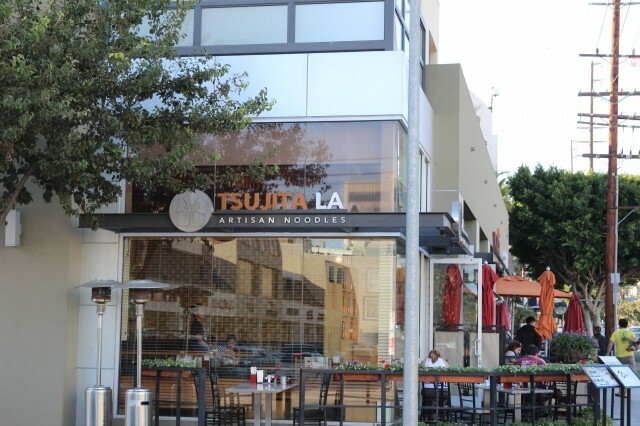 Ramen shops are expected to boom in Los Angeles for the year 2015 and Tsujita is leading them all. The shop is small, modern and quite relaxing. It’s easy to get in for a quick bite and get out. This is the year of the ramen. What better way to start if off the new year with ramen, Tsukemen to be specific. Tsujita’s Tsukemen is touted as being somewhat of perfect. Honestly, the bowl was quite delicious. The noodles were nice and tender, thick, and perfectly cooked. Dipping the noodles in the thick broth, the noodles did a good job of soaking in the flavors. The char siu though was quite thick and juicy. It wasn’t dry or flavorless. The bite of the pork was perfectly fatty and porky — probably some of the best char siu I’ve ever had. The broth was mild, not as salty as I’d like, and not as hot as I’d like. It was warm, but not really hot. The flavors of the dashi was prevalent but not overpowering. It was fatty and had a nice mouth feel to the soup. I just wish it was a bit hotter — that would have made the noodles and the char siu and noodles warmer when eaten. Other than that, the broth was quite flavorful. 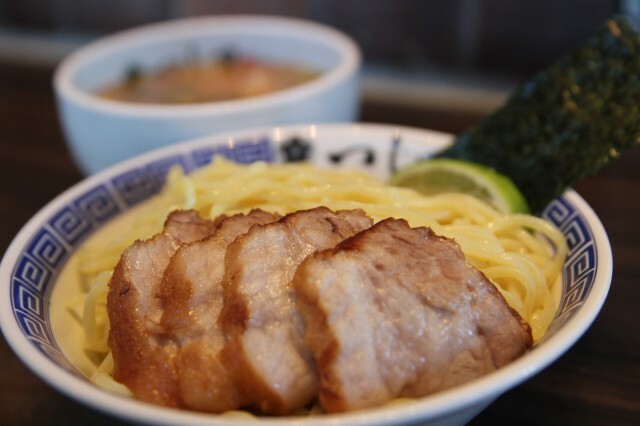 My experience at Tsujita was great, and I’d come again and again for a bowl of Tsukemen. The broth was pretty good, but the noodles and char siu still managed to overshadow it. That’s how good quality this stuff is. They take pride in having the perfect noodles. Long noodles are a sign of long life. This 2015 and on, I want to wish everyone a nice long healthy life. Ramen may not be “healthy,” but its good for the soul. And anything good for the soul is a good thing.